When you want to buy an exercise machine for your home gym, or when you go to a health club for your body work out, you will be provided with different choices like treadmills, stationary bikes, rowing machines, elliptical machines, etc. If you are looking for a complete body workout to reduce weight and strengthen your muscles then you should opt for the elliptical machines which provides cardio workout and helps in faster fat burning. When you do exercises like running or when you use the treadmill, you are repeatedly lifting your feet and pounding it on the floor or on the machine. In elliptical machine your foot remains on the pedals and this create less impact on your joints like back, hips, knees and ankles. If you are overweight then the impact on your joints will be more. Elliptical machine can provide the same workout like running on a treadmill, but without causing wear and tear to the joint tissues. Pedaling the elliptical machine will strengthen your bones and prevent you from having any bone related problems. The arm components in the machine can further enhance the fat burning process in the body. The use of leg muscles like quadriceps and hamstrings are used more when you are using the elliptical machine for your lower body workout compared to the other gym equipment such as cycle, treadmill, etc. This machine also helps to improve the coordination between the quadriceps and hamstring better than the other machines. Your quadriceps will be utilized more when you are pedaling backwards using the elliptical machine. You will be using different sets of muscles when you are pedaling forward and backward. So, this is a good machine to strengthen the leg muscles. Athletes who want to strengthen the leg muscles can be greatly benefitted by the use of this machine. You can also give a burning workout to your calves by using the inclined ramp. 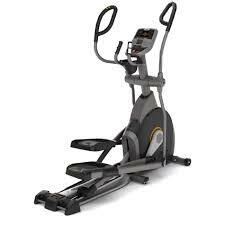 With an elliptical trainer, you are doing the workout for arm, chest, shoulder, biceps and triceps and the lower body workout at the same time. You will be saving time by doing separate workouts for different muscles in the body and you don’t have to buy or use different gym machines to give yourself a complete workout. Keeping your body upright while using the elliptical increases the utilization of your core muscles and strengthens them. Your body will be able to recover faster after each workout as the impact is low. Moreover, this machine can be easily placed in your home as it requires less space than a treadmill. An elliptical machine provides an excellent workout for all parts of the body with low impact and so it is a good machine for people with different fitness levels or joint problems. You can use this exercise machine to reduce your weight faster and in an effective way. It is also an ideal machine to get cardio workouts to keep your body fit.